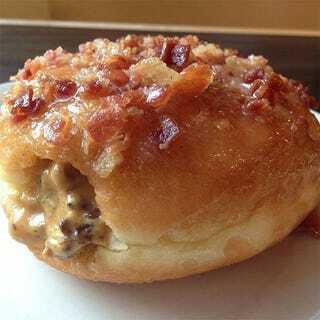 A glazed donut stuffed with ground beef and cheese and topped with bacon bits, just in case you were feeling bad about what you ate for breakfast. The D'Oh Nut Burger (discovered via the wonderful Foodbeast) is the creation of PYT Burger, a creative burger restaurant in Philadelphia, Pennsylvania. Having been born and partially raised in the Philly area myself, this creation makes total sense to me, and while I can already feel my stomach kicking just imagining it, I would like to eat several, maybe chasing them with PYT's Pepperoni Pizza Pretzel Bread Burger, because damn.